Since years the Eye4Software Hydromagic software has been protected by an USB dongle. High replacement costs when a dongle is lost. Because of these issues we decided to switch to software licenses which can be activated remotely. how activation and re-activation works and what to do when a computer got replaced or stolen. you will receive an email with activation instructions as well as an activation link within 24 hours. With this activation link, you can activate the full version of the software on one computer. you need to have both computers activated. In this case just sent us an email so we can send you a second activation link by email. Each time a request for an activation (or maintenance renewal) has been approved, you will receive an email containing an activation URL. Before visiting this webpage, make sure you downloaded and installed the full version of the software on the computer you want to be activated. After the software has been installed, it is not required but recommended to reboot the PC to make sure all drivers and services are loaded correctly. Make sure that the computer you are running on is the PC you want to activate and click the orange button to proceed. You can now close your browser and start the full version of the Hydromagic software. When you get an error message like 'this browser is not supported' it means the runtime for the software license hasn't been installed correctly. This can be fixed by reinstalling the Hydromagic software. For other errors, please contact our support department. When you decide to use another computer, a computer got stolen or the operating system needs to be reinstalled, the software needs to be activated again for this PC. As long as you have a valid maintenance agreement, you are entitled to receive two re-activations per year, which in practice seems to be more then enough. When transferring a license from one computer to another, the old license will be black listed and is not going to work long after that. This is because you are only allowed to use the full version of the software on two computers simultaneously. To ask for a reactivation, please send us an email and state customer name and the name of the computer it was installed on. When the request has been processed you will receive another URL with an activation within 24 hours. From time to time new versions of the software will be released. By default you can run all new versions released within one year after purchase. but you can also continue to use new versions of the software. When maintenance is purchased, you will receive an activation URL that can be used to extend the maintenance period of your license. Will my software continue to work after the maintenance period has expired ? Yes, the license is perpetual, it will continue to work as long as the license is still installed on the computer. However you will not be able to install updates of the software. Can my reseller reactivate the software ? 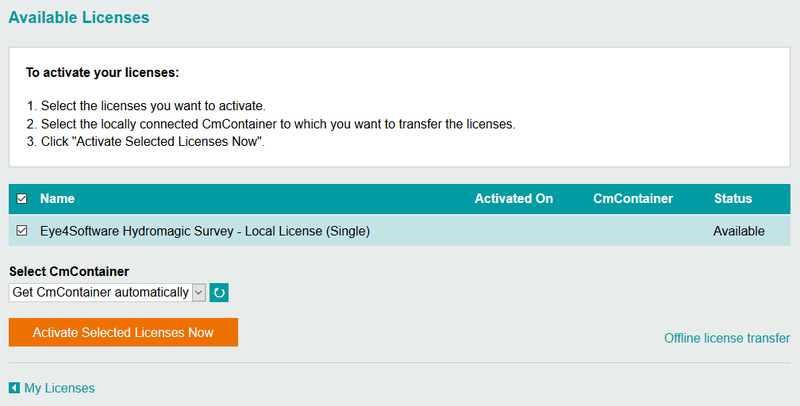 No, only Eye4Software B.V. has access to the licensing system. The reseller can however forward your request. When you normally contact your reseller for support, continue to order maintenance with your reseller though. Where can I see how many re-activations I have left ? This is not possible yet. But in the future there will be an online form where you can check and request activations. I really want an USB dongle, is this possible ? Yes it is, however there will be an additional fee for shipment, processing and taxes (max EUR 499 depening on shipment location). I already own an USB dongle, will it continue to work in the future ? Yes it will. The software will continue to check for either an USB dongle or software license. When your dongle serial number starts with 3-3 we can even push dongle maintenance renewals over the internet now. If you want this, please send us an email with your dongle S/N and we will register it and in return you will receive 3 months of maintenance for free! I don't want to pay for maintenance each year. How about reinstalling the software ? Isn't it possible to have lifetime free activations ? but because we also have to pay a fee for each software license that is installed on the computers of our customers. Since we just started using this system we will be accommodating by supplying additional activations.